MSI introduces an overclocked GeForce GTX 650 Ti, with a custom cooler, 993MHz core (default is 928MHz) and 1GB GDDR5 memory clocked at 5400MHz. Leading mainboard and graphics card maker MSI announces the release of the GTX 650 Ti Power Edition graphics card, featuring two of MSI's exclusive architectures, Triple Overvoltage and Improved Power Design, effectively boosting overclocking potential up to 17%. The exclusivly designed Cyclone II heatsink module with 9cm PWM temperture controlled fan and dual heatpipes, provides an optimum balance between noise and heatsinking. Reverse Dust Removal technology automatically removes dust from the heatsink module and maintains optimum cooling performance. PropellerBlade technology also increases airflow by 20% compared to conventional fan, effectively reducing the temperature to 57? and the operating noise to 18.89 dB in a maximum operating state. MSI uses high quality and stable Military Class III components to provide gamers with a smooth and dependable working environment, no matter if overclocked or not. The features and technologies in the power supply, cooling, and materials incorporated in the MSI GTX 650 Ti Power Edition far exceed the specifications of the reference board. The superior overclockability make it the ideal choice among its class. The MSI GTX 650 Ti Power Edition graphics card features Cyclone II cooling. The 9cm PWM temperature controlled fan provide excellent cooling while reduing the noise produced by the fan. Dual heatpipes can increase the speed of heatsinking by simultaneously spreading heat to the heat sink fins and removing heat via the PWN temperture controlled fan—a perfect conbination of quietness and heat sinking. With MSI's proprietary Reverse Dust Removal technology, the fan automatically run in reverse at startup, removing dust before rotating in the normal direction to maintain optimized cooling performance. The internationally patented PropellerBlade technology delivers 20% more airflow compared to conventional fan and also increases the cooling surface. In a maximum operating state, it effectively reduces the core temperature to 57? and the operating noise by 18.89 dB. MSI Military Class III components ensure reliable performance. They have been tested by a certified testing laboratory simulating harsh work environments and passed 7 tests, meeting MIL-STD-810G military standards. 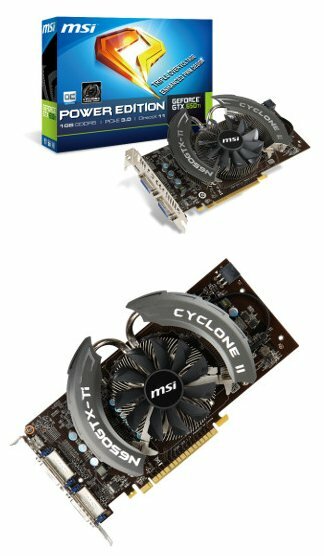 Military-grade components used in the MSI GTX 650 Ti Power Edition include a Tantalum Core Hi-c CAP, a 30% more powerful SFC, and a Solid CAP with a service life of up to 10 years. The choice of materials reflects MSI's commitment to product quality. The MSI N650Ti 1GD5/OC and N650Ti 1GD5 come bundled with one of the single most expected games to be released this year. Kicking off a whole new storyline in the battle between Templars and Assasins's. The year is 1775. The American colonies are about to revolt. You are Connor, an assassin who has sworn to secure liberty for his people and his nation. To do so, you will hunt your enemies across a staggeringly large, open, and realistic world. You will unleash your lethal skills in a violent quest that will take you from chaotic city streets to blood-soaked battlefields in the hostile American wilderness and beyond. You will meet legendary heroes of American history, and together you will conspire to annihilate those who threaten Liberty itself.